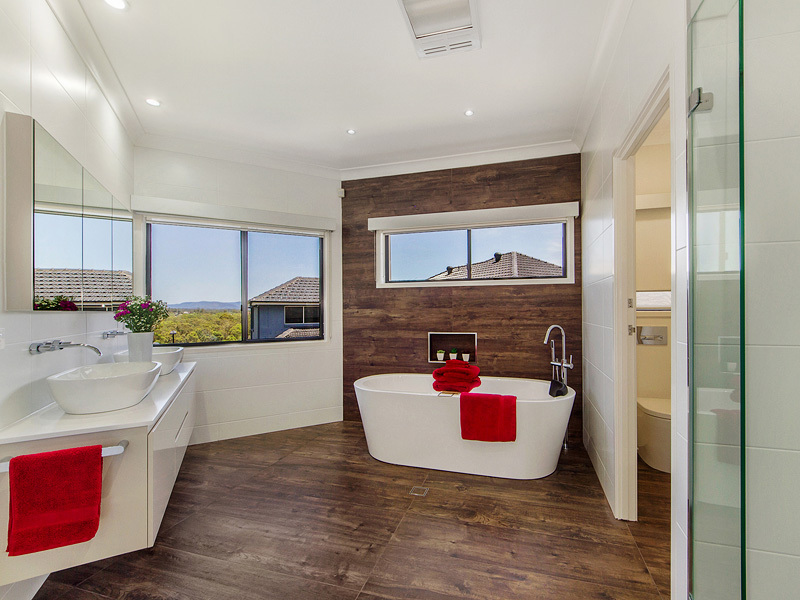 Get your dream bathroom with a quality renovation from Bathrooms Are Us. 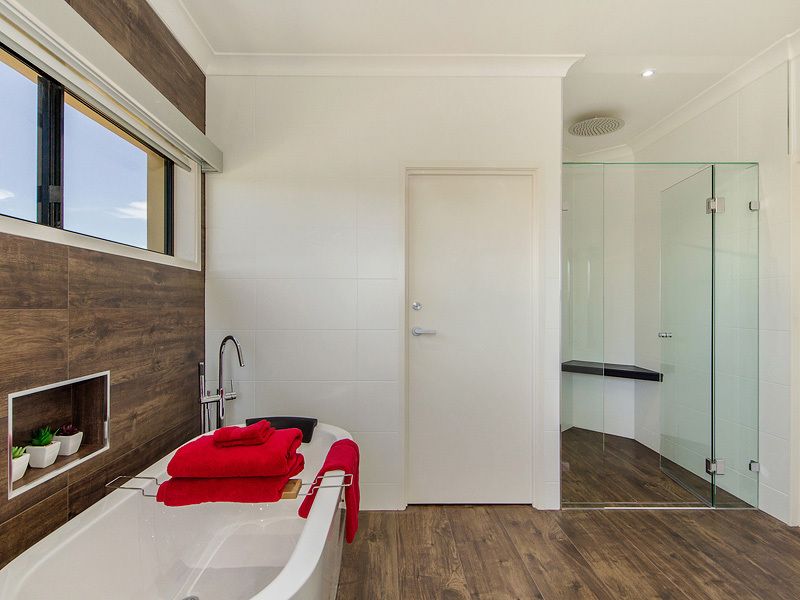 Since 1994 we’ve designed and renovated hundreds of bathrooms across Brisbane. 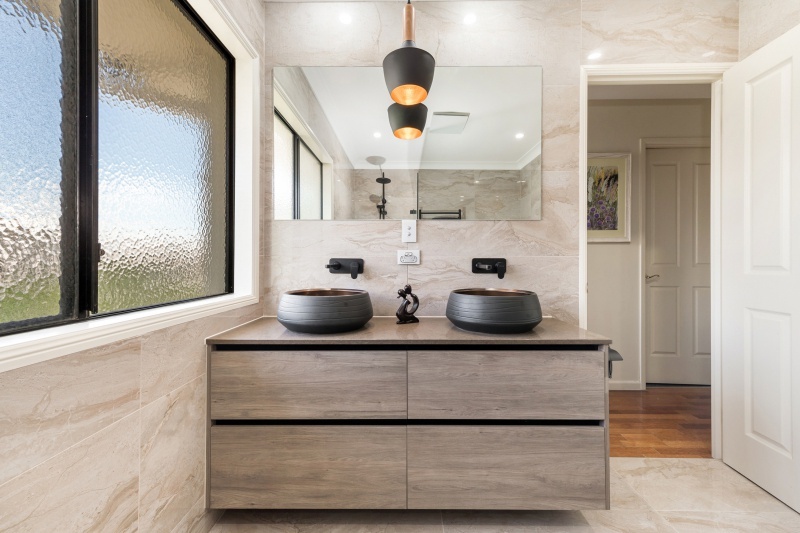 Our experienced team of designers, carpenters and plumbers will get you into your new bathroom sooner, and with a result you’ll be admiring for years to come. We’re experts in smart bathroom design, from the initial consultation to learn about your needs, to using 3D CAD design to create a bathroom that maximises space and efficiency. 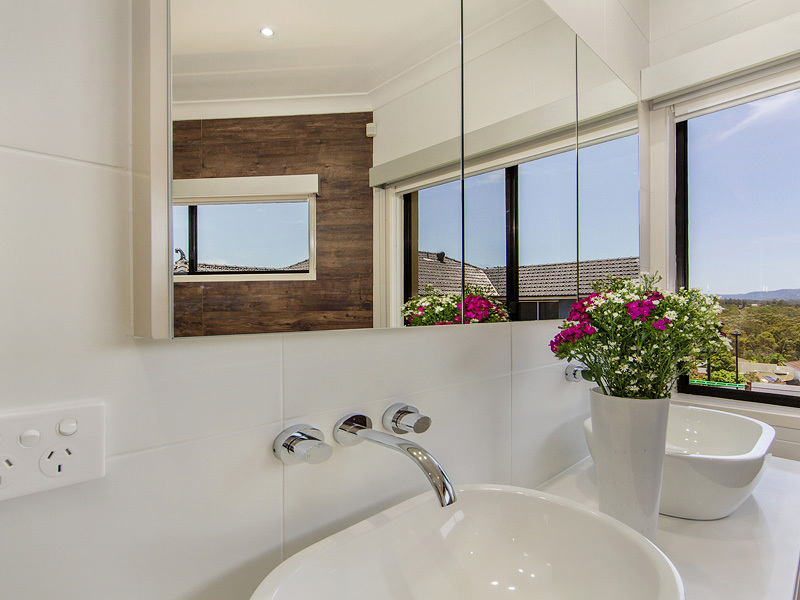 Your new bathroom will meet your every need and reflect your style while adding significant value to your home. 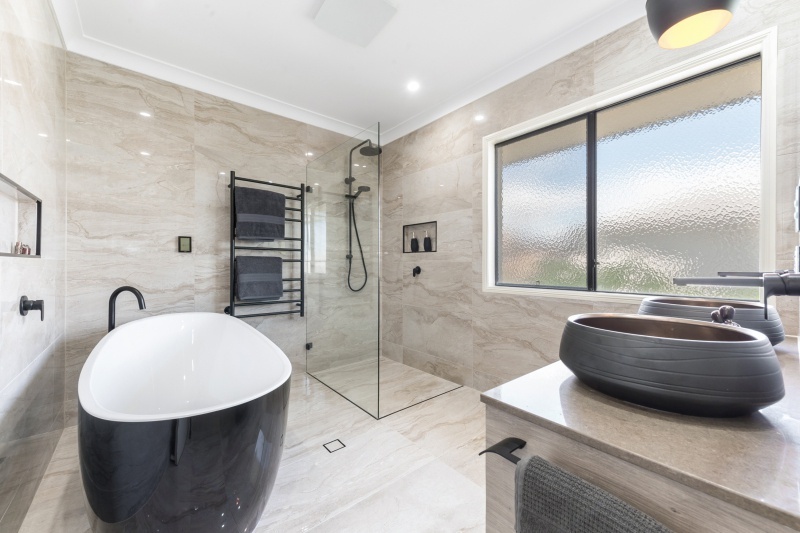 Our bathrooms are built to the highest standards, and are regular winners and finalist of HIA awards, including Brisbane Bathroom Renovation of the Year (2016) and Brisbane Bathroom Designer of the Year (2009, 2007 & 2001). We provide free consultations & obligation free Draft Proposal. Showroom appointments with our Lead Designer are available Monday-Friday from 8.30am-4.30pm. We operate a little differently from our competitors as we actually organise a free consultation in our Brisbane northside showroom before we send someone to your home. This showroom consultation provides the opportunity to discuss ideas and view products to ensure that your bathroom renovation is absolutely perfect. Over our 24 years of operation we have found this process is ideal, as it enhances the communication process and ensures that you feel more confident in your product selections. Download our info sheet for more information and to find out how we differ from our competition. We are happy with the design and finishes of our bathroom, but need some minor repairs. We are happy with the layout of our bathroom, but would like to change the finishes and fittings. 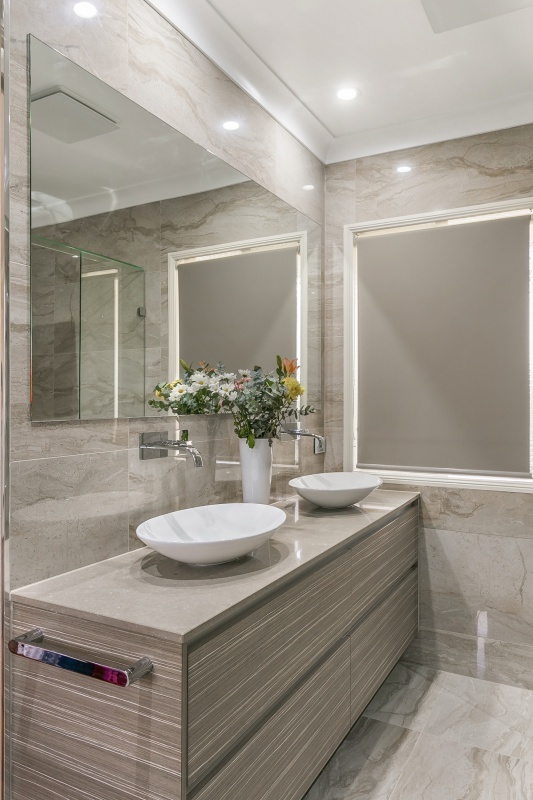 We would like to start fresh, changing the design and all the finishes We would like to add a new bathroom or ensuite on to an existing room We would like to fit out the amenities in a commercial building. Why should I choose Bathrooms Are Us to renovate my bathroom? Bathrooms Are Us have a reputation for being leaders in the fields of bathroom design, construction and project management. We are known for their attention to detail and superior customer service. Bathrooms Are Us has been a member of HIA & Kitchen and Bathroom Association for over 20 years, working to all national and local standards. In previous years we have entered a select few of our unique bathrooms in the annual HIA – National Kitchen and Bathroom Awards, in which have had great success – Winning the award for Bathroom designer of the Year in 2001, Bathroom Project of the Year in 2001 and HIA 2007 & 2009 Bathroom Designer of the year (Bris) & Renovation of the Year 2016 – Brisbane; Over $40,000 Category. What if there is asbestos in my walls – will I still be able to renovate? We can arrange an asbestos test to all houses built before 1984. Firstly, we take a small sample and send it off to a lab for testing. If asbestos is found in your sheeting, we can then can organize a licensed asbestos company to remove and dispose of the sheeting in the room being renovated. This will create a safe environment for both your family & our tradesman. What do I do during the renovation if I only have one bathroom in my house? 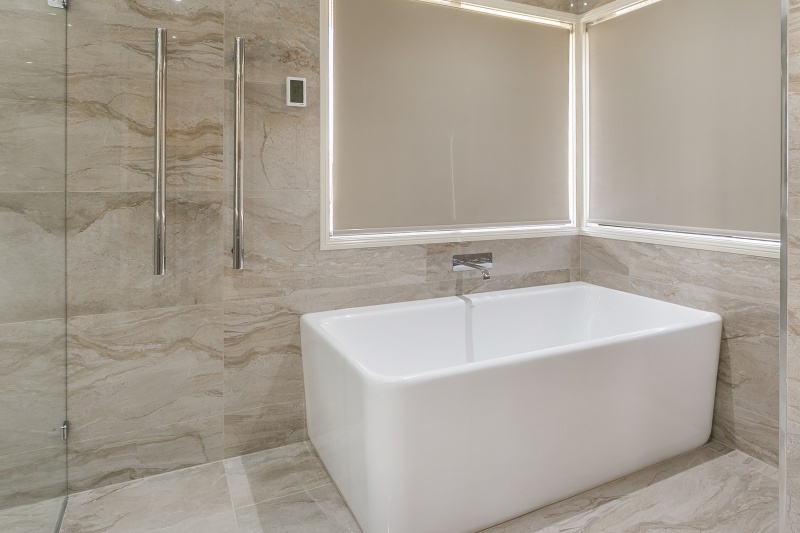 If you only have one bathroom we can arrange for your new bath to be connected and usable within 3 working days subject to site. If you only have one toilet and the new one is to be placed in the same position, you will only be inconvenienced for approximately 48 hours during the construction period. Our main purpose is to limit the amount of inconvenience you are to experience during the construction process. We can arrange a portable bathroom to be placed outside of your house www.ensuitestosuit.com.au Quote Bathrooms Are Us for price. Who chooses the products and tiles that will go in my bathroom? We believe that no one knows your taste better than you do, so we make sure that you are an integral part in the selection process of all bathroom products and tiles. If something doesn’t suit or may clash with other products – we let you know! We also have qualified Interior Designers to help you select suitable tiles for your bathroom. You can also arrange another appointment with our showroom Consultant who will run you through all your options available with items such as toilets, baths, basins and bathroom accessories. What happens if I am not home during the daytime and your tradesman require access to my house? We supply you with a login and password for your project that outlines the days that certain tradesman will be on your site. If you are not available at these times trades have access via a secured key box. We maintain strict security processes to ensure your home is always left secure at all times. Do I receive a warranty on all work conducted by your company? Within your contract price we include a QBCC Warranty which covers all work conducted by our company for a period of 6 ½ years, so you can be reassured that all our work is guaranteed. Can you show me a Sample Quote? With ceramic white china top one tap hole with overflow and flat D handles 2drawers and 2door. 1x Paco Jaanson Nex Gen BTW toilet suite with soft close seat b/inlet 4.5/3l 4 stars 60mm to 170mm set out. 1 x Flexispray Cascade II 3 Function shower rail wire chrome soap basket /Double wound metal hose. 1 x Pop up basin waste. Supply and install 3 in 1 IXL Unit 1 light,2 heat lamps,1 exhaust. Supply and install one double power point. No allowance to alter any other electrical work. All relevant materials have been included to carry out bathroom renovation. All surplus material delivered remains the property of Bathrooms Are Us and will be removed from site on completion. Supply and install up to 21sq/m of villaboard to bathroom walls. Supply and install 7.2 sq/m of plasterboard to bathroom ceiling. Supply and install standard door architraves to entry door. Supply and install shower angle to create walk in shower. Supply and install door angles to bathroom and toilet. Supply and install up to four ceramic bracing sheets to bathroom & toilet floor. Lay drop sheets over floor. Supply 4cm skip bins for rubbish. 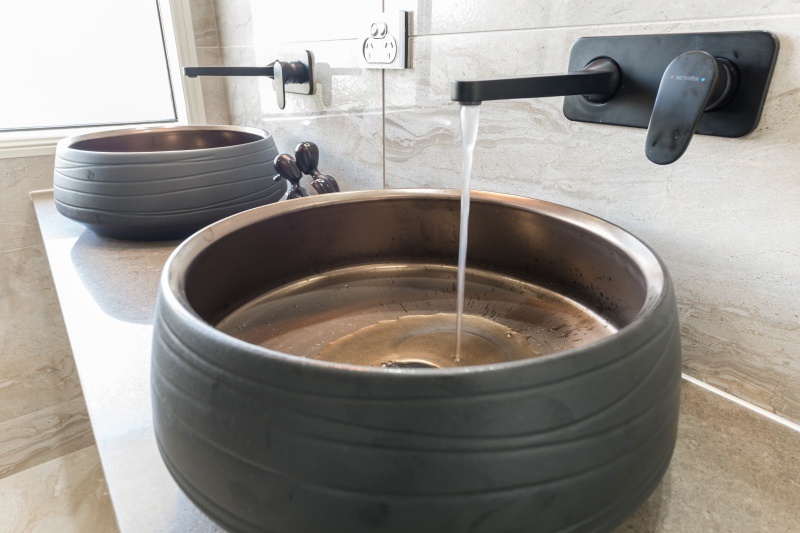 Strip existing sanitary fixtures & fittings and disconnect water and drainage. Leave existing walls and ceiling to toilet. Strip one row of skirting tiles to toilet only. Additional cost of $80 will be charged to test for asbestos per sample. No allowance has been costed to removal or disposal of asbestos from site. All wet sealing will be carried out by licensed contractors and certificates will be held by ourselves as forms of guarantee. Carry out wet seal to full floors in bathrooms and toilet. Disconnect vanity /shower/bath and toilet. Connect vanity waste & one basin mixer. Connect shower waste & one wall mixer. Connect wall faced toilet suite to existing sewer pipe. Carry out framing and noggings to existing walls as needed. Reline wall to bathroom with villaboard. Reline ceiling to bathroom with plasterboard. Install wall hung vanity unit. Plaster tape new walls set ceiling and install cornice to bathroom. No allowance has been made for any painting. If required add between $500 to $700 to cost for painting to draft. Install up to 4.5 l/m of skirting tile to walls with wall tile. Provisional allowance of $840 to purchase tiles. Professional cleaning of bathroom upon completion. QBCC insurance for all work over $3,300.00 in value is included. Delivery cost for materials included in quote. Tempering valve to hot water system. Any removal of load bearing members. Any water or termite damage repairs. Specialist removal/disposal of asbestos, plus clearance certificate costs. Supply of feature tiles (for example stone, glass, mosaic strips, border tiles. All prices are subject to rise and fall in accordance with Bathrooms Are Us current suppliers’ recommended prices or Government levied increase without notice. If acceptance exceeds 14 days, prices will need to be confirmed. 10% deposit on signing of contract. Other terms and conditions are stated on signing of contract. Check measure on site to confirm price. 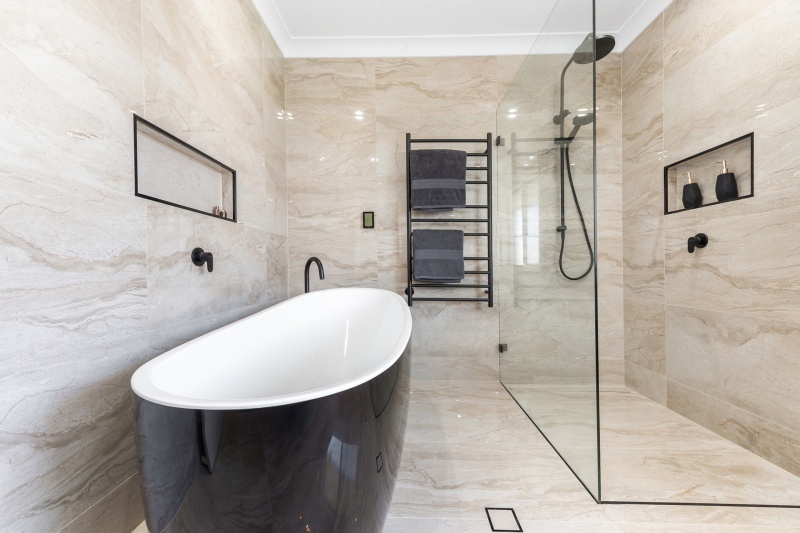 I want to add an ensuite to one of my bedrooms – will I need to organise a builder to construct the walls before contacting your company? We use fully qualified carpenters who are able to add and reconfigure walls for any type of project. Our Interior Designers can help guide you through possible wall reconfiguration to utilize all available space. So whether you need a new ensuite or want to add in an extra bathroom, we can help you with all aspects of the process. Yes. Australian standards regulations require wet areas to be waterproofed (e.g. Bathroom floor, shower floors and internals, splash areas above baths etc.) by sealing them with a waterproofing membrane. This includes some tiled areas. We use an accredited waterproofer to make sure that all your waterproofing is applied to Australian standards. All waterproofing prevents any future water damage to bathroom walls/floor and neighboring rooms. Will the design and construction of my bathroom be managed by Bathrooms Are Us? Yes, all processes from design brief to construction are conducted by our professional in house staff. We employ our own Interior Designers, Project Managers and use fully qualified tradesman including; electricians, plumbers and tilers. This means that you can be assured of complete quality control of your project from start to finish. We also have admin support that is there for you Monday-Friday 8.30am-4.30pm if you have any general questions or concerns. Will the rest of my house become untidy or damaged during construction? We do everything in our power to prevent damage (and mess) to the surrounding areas of your bathroom. We do this by using both hall runners and drop sheets.